Officers in Aberdeen are advising businesses to be aware following a number of reports of fraud and attempted fraud in Aberdeen this week. On Monday, 8 April, an attempt was made to defraud a business out of £8000 following a card payment machine fraud and on Tuesday, 9 April, a further two businesses in Aberdeen were targeted. Attempts to gain thousands of pounds were again made. Officers are looking to trace four men in connection with the incidents who may be able to assist with enquiries. The first man is described as being black, of slim build and around 6ft 3ins tall. He was wearing sweat pants, a zip up jumper and a dark north face jacket. The other three men are described as being of Asian appearance and were all around 5ft 10ins tall. All the men have been described as having possible London or Birmingham accents. "We are advising businesses in and around Aberdeen to be aware following a number of recent reports of fraud and attempted fraud in Aberdeen involving the use of card payment machines. The culprits are using a distraction technique to carry out the fraud. While members of the group distract staff in the shop, the other members of the group are taking the card payment machine, which is in easy access on the shop counter, inserting their own bank cards and then authorising a refund onto their cards before returning the card payment machine to the counter. It is not until later the businesses are realising they have been the victim of fraud." "I am urging all businesses to be alert to this fraud technique. 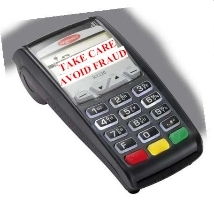 Do not leave your card payment machines on open display where anyone could easily pick it up without your knowledge. Be alert to anyone entering more than the normal amount of digits while using the card payment machine. If you feel uneasy or suspicious at all contact Police Scotland on 101. "Anyone with information is asked to contact police on 101 using reference number CF0086720419."